Holly Page recaps on an eventful January that included lots of running, travelling and purchasing a four-wheeled home. Well 2019 didn’t go off to the best start. Waking up in Yorkshire, I welcomed in the New Year with a rather sore head and a rather sore knee. Why the sore head? Easily explained by a mixture of mulled wine, prosecco and champagne. In hindsight, it wasn’t the best hydration strategy immediately after running halfway round the Calderdale Way, a 50 mile loop around the Pennine hills of Calderdale which, given that my house is at the halfway point, I thought would make an excellent New Year challenge. 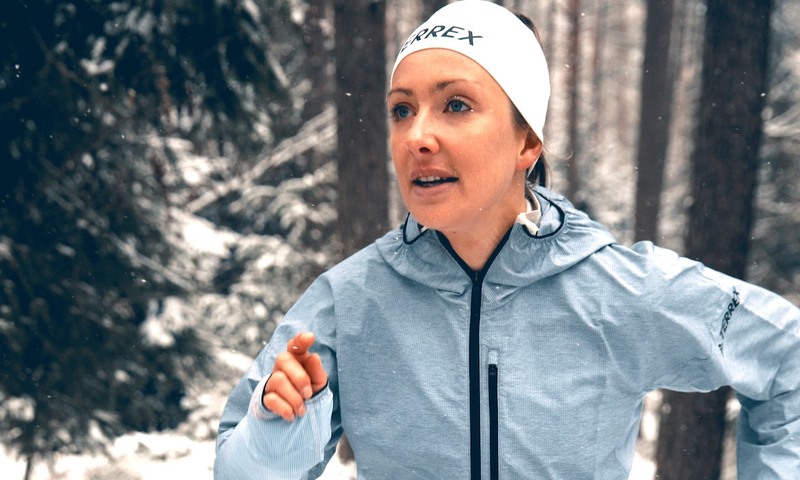 I had initially wanted to do the run in one-day, but, despite being an Ultra-Queen, my friend Katie Kaars-Sijperstein sensibly persuaded me that although perhaps less of a challenge, running the 50 miles over two days would certainly be more pleasurable. This then leads to the explanation for the sore knee. As soon as we set off on day two I was feeling twinges down the outside of my knee. Most wise runners would have turned around, but I just decided to keep on going, hoping it wouldn’t get much worse. I thought I might at least be able to remedy the hangover by eating a huge slab of chocolate cake for breakfast (after my muesli), but unfortunately, that only served to reinforce the nausea. Mind you, the sun was shining so I told myself to be merry and bright. 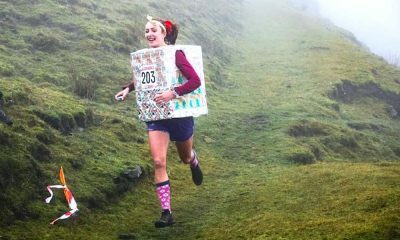 One sure fire reason to be merry and bright was the Giant’s Tooth Fell Race, which just so happened to be a mile or so off our Calderdale Way route. Anyone who knows me knows that I’m never one to turn down the opportunity to run a race. Two hours into our run, it was definitely the longest warm-up I’ve ever done but it was good fun starting right at the back and having a jolly run around without feeling the need to be breathless like most three mile races! We apologised to the organiser for not staying on for the prizegiving; we still had a few more hours to go to bring the day’s total to 50km and didn’t really fancy carrying a bottle of prize-winning beer in the backpack. Other than the knee problems, it was such a lovely couple of days of fab weather in great company, reminding me that long runs are always better shared! @katie.kaars.sijpesteijn and I saw out the old year and welcomed in the new by running 92km around the Calderdale Way…. and in case today's mileage wasn't enough to cure the hangover we even included a little detour to run around the Giant's Tooth Fell Race! The next day was my birthday and I’d hoped to do a speed session. But given the knee situation, I decided to try and replicate the endorphin rush by doing 5x2minute dips in the freezing river instead. It definitely got the blood pumping. As the knee hadn’t improved and was sore even walking, I took a few days off exercise and then cashed in on my brother’s kind Christmas present to me, one week’s membership to the local gym. When I was living out in Africa I had to do a lot of training in gyms as I couldn’t train outside much, but I find those machines incredibly monotonous if I don’t have another stimulus; I can’t just listen to the Top Hits cranking out over the speakers, so I put my headphones in a (usually futile) attempt to drown out the disco with some Radio 4 podcasts or by reading books on my kindle. I’m very fortunate in that despite being 29, my parents don’t mind me coming back to Page Family HQ from time to time. After spending much of the last few years wandering the world (I didn’t spend more than two weeks in any one place in 2018!) it was nice to have a couple of weeks in one place. It’s when I’m back in the Calder Valley that I appreciate its beauty – I’ve travelled all over the world but am always amazed by what I can find close to home. Talking of home, as I’ve become known as somewhat of a nomad, hitch-hiking my way to most of my races last year and putting my tent up on mountainsides / forests, spending my days seeking out plug sockets and wifi so I can get my work done, I thought that it was about time I made a step to minimise some of the uncertainty of being an eternal wanderer. So I decided I would buy a van to live in – hence solving the lack of a house and lack of transport issue in one! But van buying wasn’t as easy as I thought. I spent hours and hours researching every possible van combination, drove for hours to visit some, ‘ummed and ahhhd’ about the trade-offs between mileage, age, cost… almost bought one on so many occasions… but ultimately came to no conclusion. By mid-January, I was on a flight to Gran Canaria. 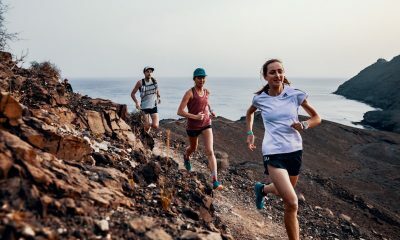 I’d been invited there for the Pilancones Tunte Trail, a 44km race with a few thousand metres of climbing as it wound its way through the rugged mountains, including up Pico de las Nieves, the island’s highest point. I thought it would be a good opportunity to top up the vitamin D levels and given that I was being put up in a nice hotel, I’d have a place where I could work for the week as well. A French friend Audrey also came out and we had a good week making the most of the all-inclusive hotel meals, going on some bike rides to escape the retiree infested resort and in and amongst I slowly but surely pieced together the jigsaw puzzle of staffing a proposal for a Foreign Office international development programme. One day I was checking my work emails whilst waiting for Audrey on a hill on my bike (the poor girl who gave up sport a few years ago had been coerced into running a trail race AND having to pedal up and down some hills in the days afterwards). An email from eBay said: “Congratulations, you are the winning bidder. Please pay for your campervan.” Say whaaat? I’d looked at so many vans I admittedly had no recollection of any of the van’s details. I checked out the spec of my inadvertent purchase and it actually seemed ok – not really fitting any of my criteria, but somewhere in the middle of all the extremes. I was pretty relieved to finally have one though, now I could stop wasting time scrolling Facebook Marketplace and Gumtree and asking questions about leisure batteries and pop-up rooves to recently divorced men in Wigan. I looked at where I needed to pick it up from. Newquay, oh excellent! Close to West Yorkshire then… I do love a logistical challenge. This year I’ve joined the Adidas Terrex Team, so I swapped sunshine and sand for shivering and snow flying straight from Gran Canaria to Germany to meet with the guys at Adidas HQ for a few days. Those days in Germany I had so much work to do as well as the day long meetings that I was trying to squeeze my training in wherever possible, so it wasn’t ideal when I’d rock up to the hotel gym at 6 am to find a rotund German Businessman just starting his 60 minute morning walk on the gym’s only treadmill. I had to make do with the cross trainer which wouldn’t have looked out of place in a 90’s Mr Motivator show. At the end of January, I had ideas of running the Southern Cross Country Championships (despite being an ardent northerner), but unfortunately, I had to go ‘straight’ from Germany to Cornwall to collect my van! So I followed up the Adidas trip with a three-flight extravaganza (sorry environment) from Nuremberg to Paris to Manchester to Newquay to have a wild blast run in the dark (thanks flight delays) on the Cornish coast before driving my van north through the night back to Yorkshire – occasionally stopping in a service station for a power nap on my new pull out bed given I’d been awake since 3 am. I had two whole days in Yorkshire to enjoy unpacking, repacking, working like a crazy woman and surprise surprise even squeezing in a bit of running. Now I’m back at Manchester airport waiting for yet another delayed flight after pulling an all-nighter so I could get work done before travelling. Next stop Costa Rica for a 250km stage race through the jungle. More on that in February. 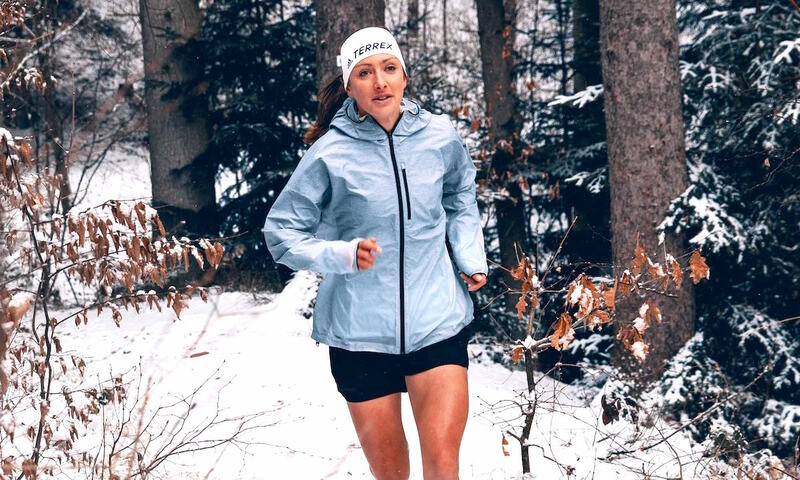 Holly Page features in the ‘Fast 10: class of 2019’ and over the course of the year will share her running journey. You can follow Holly on Twitter and Instagram, while further information about the ‘class of 2019’ can be found here.